This week we were presenters and partners at the Law and Courts in an Online World Conference, held in Melbourne, Australia and run by the Sir Zelman Cowen Centre. Justice is a key area that Portable actively seeks to drive change using smart design and technology. Simon Goodrich and Ellie Burge from our team explain their observations and insights into the future of justice, the legal system and courts. 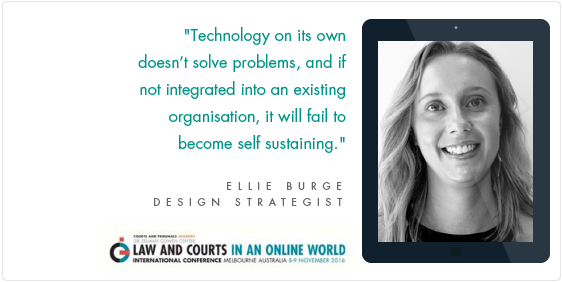 Here are five key takeaways from our favourite speakers at the Law and Courts in an Online World Conference in November, and the way we believe justice issues should be approached. It was amazing to see so many passionate people come together to talk justice and technology. After all, being open to innovation is the first step towards changing the world collectively. The legal system, being a human creation, is subject to change and improvement. Even an institution as old as the law can be modernised. We need to innovate to align legal systems with modern legal needs such as accessibility, client-centred services and responding to disruptive technology. User-centred design has never been more relevant. We must engage in conversation with users to discover their needs. By gaining a deeper understanding of how its citizens use services, the legal profession can better utilise technology to improve access to justice. For example, online dispute resolution (ODR) systems are becoming a way to modernise litigation. Vic Legal Aid talked about the possibility of implementing the Rechtwijzer system, an ODR platform created by the Dutch Legal Aid Board, to expand access to justice. Technology will let the public become active participants in their justice system by tearing down barriers to entry like cost, time, and complexity. The system aims to support people throughout their justice journey by employing “people-based justice” — allowing people to manage their own process. The best way to analogise this is through looking at the Bay resolution centre, which resolves over 60 million small consumer disputes annually. It aims to be a fast, fair and efficient means of resolving disputes for small claims. Many legal cases are simple and they can (and should) be automated — in turn, saving a court’s time and money and thus spending the court’s resources elsewhere. Don’t seek perfection. Just get the system up and running. You can discover so much by testing and triaging something new, even if it’s not successful the first time. Seeking perfection can be a barrier to progress and can hinder development for not just access to digital justice, but also innovation. Similarly, Shannon Salter advocates adapting quickly to new systems: put services where the public is (i.e. online) and don’t wait for the perfect system. The goal should be to first and foremost address the problems: the solutions can always be improved upon later. It’s not uncommon for people to be afraid of failure. Nowhere is this more obvious than within the legal profession. However, as Jon Cina from Vic Legal Aid says, it is essential to change the way lawyers think about risk and failure. By sticking to traditional systems and processes, by refusing to adapt and be innovative, nothing will change. It’s fine to use existing content and structures to make something great. It’s great to dream big, but starting small will give momentum to keep going. For example, the Canadian Tribunal system is based on Salesforce, a cloud-based sales service. Rather than starting from scratch, the legal system turned to a structure that was successful and reliable and adapted it for their own needs. As the legal landscape evolves to encompasses digital and online, law students are embracing technology by developing legal expertise websites and apps. It again emphasises the need to be open to innovation and to deliver services that are needed, rather than sticking to traditional legal methods. We can all learn from this. But the responsibility lies not just with students, but also their lecturers and academics to keep updated and aware of new developments in law. They need to challenge themselves to upskill and participate in technological areas. Technology is constantly going to reshape the way the law serves its citizens. Here at Portable, we continue to transform justice by delivering more efficient and accessible client-centred services. See what we’ve been doing in this space.